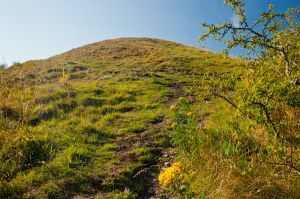 If Gop Hill Cairn (sometimes simply called The Gop) were located in a more populated area it would be celebrated and the subject of endless speculation like more famous sites such as Stonehenge and Silbury Hill. But it is not, and for that we should, perhaps, be grateful. Gop Hill is a strange manmade mound, or cairn, built sometime during the Neolithic period, on a high hill overlooking Trelawnyd, Flintshire. 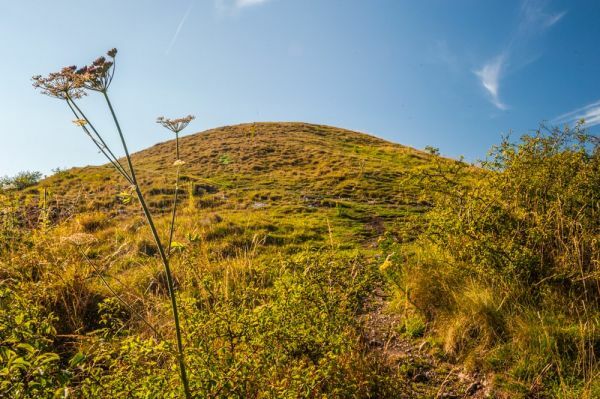 This peculiar mound is the second largest manmade mound in Britain, smaller only than Silbury Hill. The mound measures approximately 100 metres x 68 metres at the base and stands 12 metres high. It is built mainly of stone and blocks of local limestone. 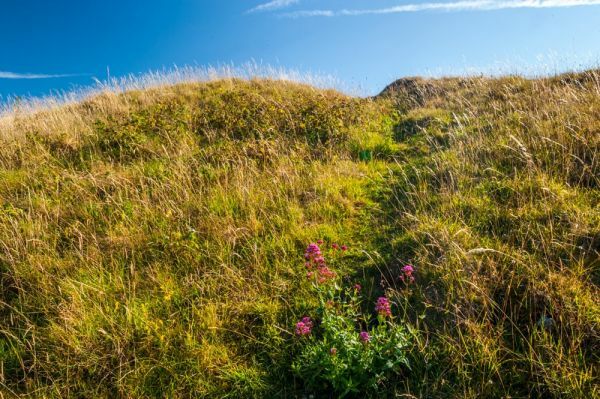 Like Silbury itself, we are uncertain why Neolithic people put the time and energy into building the mound. Was it an astronomical observatory, as some have speculated? 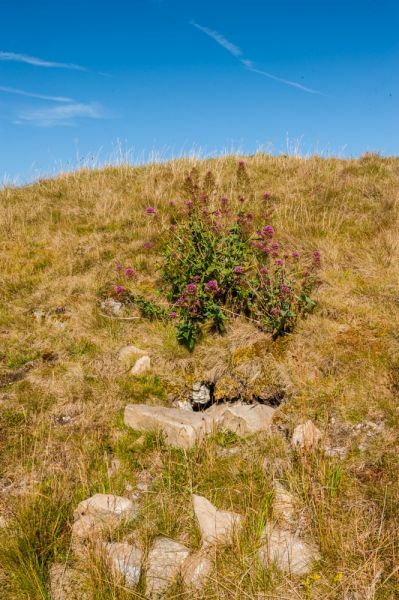 A burial mound to a long-forgotten king? A religious site? We simply don't know. Excavations into the mound in 1886 revealed no inner chambers or burials of any sort, though flint arrowheads were found in abundance. Was it then intended for defence? This is certainly a possibility, but there are no apparent outer banks and ditches, which you might expect if it was meant to repel attackers. 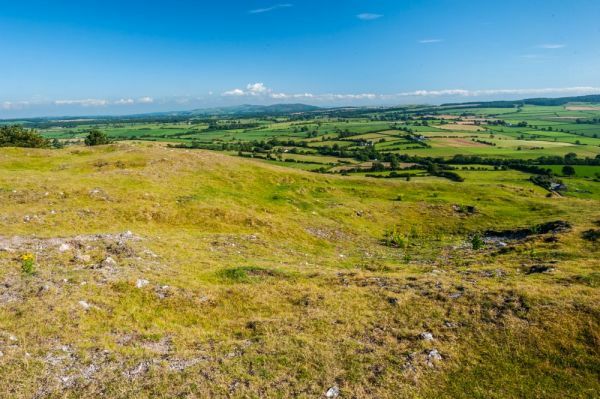 To the south-west of the hill are caves which were used as a burial site in Neolithic times, and the area around the hill is strewn with further burial mounds. Is it perhaps part of a complex of linked sites, as yet unrecognised? Perhaps, but for the moment the exact purpose of Gop Hill is a mystery. I said that no tales adhered to Gop Hill. That's not strictly true, for one legend suggests that Gop was the site of Queen Boudicca's last battle against the Roman army. Which, if you follow the known historical record of Boudicca's revolt, seems highly unlikely at best. You can reach Gop Hill from the main parking area in Trelawnyd. 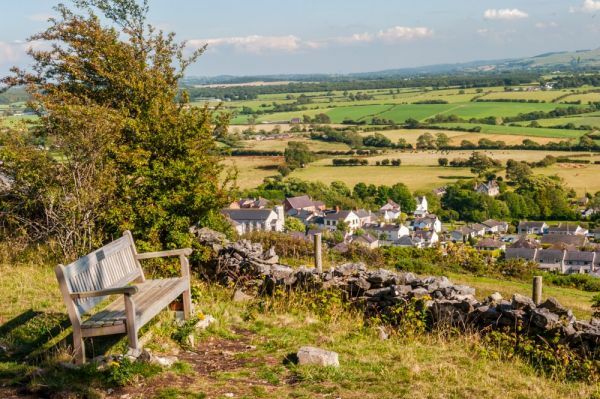 There are two routes, one off the Llanasa road on the outskirts of the village, and the other from the end of a drive just off the High Street. Just follow the path to the summit above you, at the tree line. The going is fairly easy, and the hill is not high. In summer the site can be a bit overgrown, as it doesn't appear to be looked after at all, but once you reach the mound you start to realise just how big it is. It must have taken an astonishing amount of work to create the mound. The sides are very steep, and the view from the top is wonderful. I'm not sure I left with any great appreciation for the history of the site, as the signage was a bit obscure, but I certainly had a great deal of admiration for the amount of work it must have taken to create it in the first place!